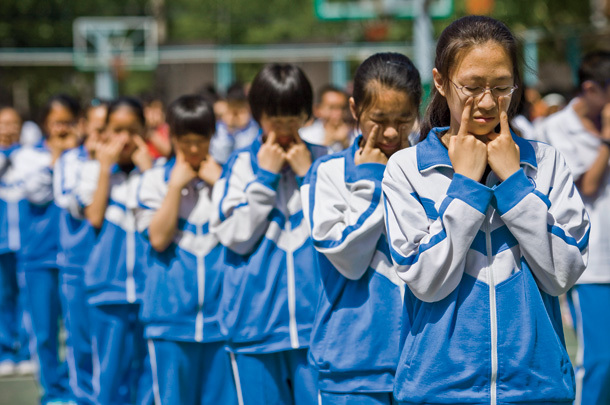 An intimate look at a group of elite Beijing high-school students reveals how China’s schooling system is one of the resurgent nation’s greatest strengths–and biggest weaknesses. Here is an existential question of high-school philosophy: If everyone is equally nerdy, does that mean no one is a nerd? In The People’s Republic of China, you might add the following corollary: Is collective nerdiness the way forward? As twilight descends in Beijing on a Saturday in March, an informal meeting of nerds commences outside the Second High School Attached to Beijing Normal University. Class has ended for the day, and the streetside air is noxious and smothering–Beijingers sometimes euphemistically call it “big fog,” when in fact it’s actually unrelenting, overwhelming smog. The bespectacled quartet of teens–Bob, Daniel, Julia, and Janice (whose glasses don’t have lenses in them)–hurriedly try to figure out what they’re going to do next. Instead, after grabbing a quick dinner together, they head to a McDonald’s across the street from the school. They each order a cup of tea, and then pull out their reading-comprehension books to study quietly for another hour, before heading home to study some more. The point of all this rigor: to remove every possible distraction as the students prepare for the gaokao, the national college-entrance exams, which are seen as the gateway to success in life. For seniors at Second High, the pressure is extreme. If all goes as planned, its students will eventually join the elite that is driving China’s political and economic resurgence. They will become thought leaders, Communist Party officials, power brokers, billionaires–and, just maybe, reformists. Over the past year, I followed a group of seniors as they prepped for the gaokao and the next stage of their young lives. What are their teenage dreams? What gives them angst? How do they express themselves, or not? What hopes do they have, for themselves and for their country? I also wanted to hear from their parents. How are the real Tiger Mothers and Fathers–with a strong helping hand from the peculiar species one might call the Tiger Teacher–grooming a new generation of Chinese leaders? I was an exchange student at Second High in the late 1990s, part of an effort to escape my own nerdy existence in California. The experience was strangely liberating. The uniforms provided blessed relief from the unbearable early-morning pressure of having to decide which clothes to pick out from the pile on my bedroom floor. If there were cliques among my Chinese counterparts, I never noticed them. Nor was there sexual tension–I could not understand what they had done with their teenage hormones. My librarian back home had once derided my bookish ways by quoting Mark Twain to me: “I have never let schooling interfere with my education.” Get out of here! was her warning. Go forth and socialize. Chinese students are taught the precise opposite, which became clear on the very first page of my classical Chinese textbook. There, I found a story about the renowned poet Li Bai. For unclear reasons–boredom? frustration? finances?–the young Li drops out of school. Then one day, he encounters an old lady on the road. He asks her why she is methodically grinding a seemingly pointless rod of metal. She explains that she’s sharpening it into a needle, an object that is useful. It inspires him to do the same–to his brain. As legend has it, he returns to school, and 1,200 years later, he is still the most famous poet in China. 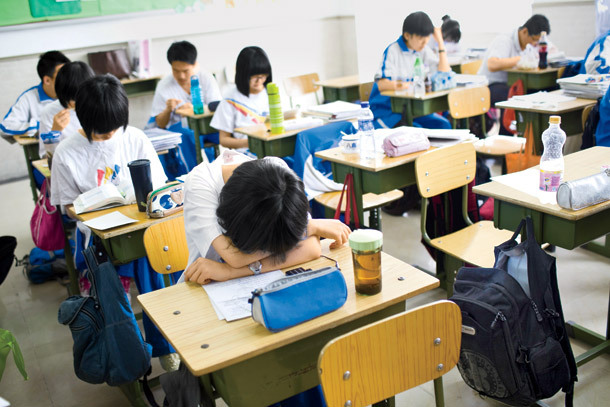 For Second High seniors, schooling–and the entire sharpening process–is devoted to prep for the gaokao, which this year took place on June 7 and 8. The word gaokao, literally “high test,” is mercifully short for Putong Gaodeng Xuexiao Zhaosheng Quanguo Tongyi Kaoshi–the Standardized Higher-Education Student-Admissions National United Examination. The grandiosity of the name speaks to the exam’s 1,400-year history; by comparison, the SAT, introduced in 1901, is a rank newbie. When the gaokao’s predecessor debuted during the Sui Dynasty, which reunified China during the sixth century, the imperial government’s top goal was stability. It sought to secure power and maintain unity, and toward that end, it needed hardworking, literate local hands who could govern occasionally restive, politically volatile populations. (How times don’t change!) So the mandarins developed a test to scout for bureaucratic talent. That person also has the best chance to enter China’s university system, since the gaokao is the sole gateway. The exam is seen as so important that every June, the newspapers fill with gaokao-related stories and announcements, from restrictions on building construction to reduce noise on testing days, to tales of kind policemen who whisk tardy students to their exam sites. Attempts have been made to upend the system; a public university, South University of Science and Technology of China in Shenzhen, went renegade, announcing that it would evaluate applicants by criteria other than test scores. The Chinese government responded by announcing that it would deny official diplomas to students admitted on that basis. This is only partly true. Bob and his classmates got into Second High by scoring well on an entrance exam, and most of them are children of the intelligentsia. Also, China’s government discourages migration from the provinces to the nation’s biggest cities, so quotas ensure that the best colleges, such as Tsinghua and Peking universities in Beijing and Fudan in Shanghai, draw disproportionately from the surrounding urban populations. About a decade ago, after reports that Beijing students got into elite institutions despite scoring lower than students from other parts of China, authorities stopped giving the same gaokao nationwide. If you live in Beijing, you are 30 times more likely to get into Tsinghua than if you live in Shandong Province, which is akin to saying that a Bostonian would be 30 times more likely to get into Harvard than a kid from Vermont. Later, perhaps sensing that this is not typical teenage life elsewhere–even for nerds–he turns defensive. “Grades are really important, but they don’t mean everything,” he says. “We develop our own interests and enjoy ourselves in our daily lives.” He offers no details. 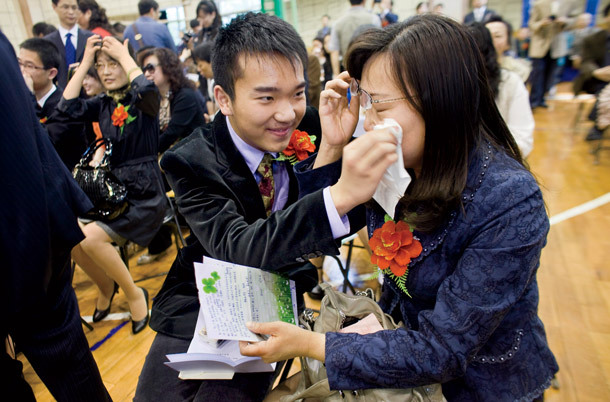 The Second High regimen is designed to help its seniors excel on the gaokao. For all three years of high school, a student shares a classroom with the same 29 classmates. When the bell rings to mark the end of a period, the teachers, not the students, change classrooms. During lunch, most students study. Nap time is 15 minutes after lunch every day. During senior year, there are no electives; the school chooses each student’s courses. One sweltering day in June, I visit Daniel Zhou and his parents at their apartment. It’s in a typical old Beijing high-rise, with an elevator lady who pushes the buttons for you. Daniel’s mom, Wang Yongyan, a kindergarten teacher, repeatedly apologizes for the clutter, though the apartment is quite neat. Daniel’s room has few accoutrements other than a globe, his guitar, a wall map of the world, and lots of schoolbooks; as we walk in, he says hello to his two box turtles, Smart and Stupid. Coppelia/Pealina/Coco/Rosalind–whose father is a financial investor–says her career goal is to improve the quality of education in the countryside. “I want to go to towns and report on how unequal the educational opportunities are,” she says. To do that, it’s generally held that she must excel on the gaokao to trigger a time-honored career domino effect: secure a place at a good university, join the Communist Party, get into the ranks of the government bureaucracy. Chinese Communist bliss. In China, there is a time-honored career domino effect: good gaokao score, top university spot, communist Party membership, job in the government bureaucracy. Appropriately, perhaps, Sophie’s nonmilitary fallback would be a career in human resources. In China, where so much in business and politics is based on guanxi–connections–the HR department is one of the most powerful perches in any organization. It attracts some of the most ambitious and cunning students. Even if the good kids did it, they know better than to talk about it. Such is the squeamishness about high-school love–zaolian, or “premature affection”–that the government rarely allows it to be depicted on TV. Also, many of the students have heard the tale of their unlucky classmate Zhang Qingxue, whose dad works for the phone company. Midway through her junior year, Zhang recalls, her father presented her with a 16-foot-long roll of her mobile-phone records. He angrily confronted her about one text message, from a boy, that read, “Wo ai ni.” I love you. “He was really mad,” she tells me. So she pretended to break up with the boy. A few prominent Chinese have become icons for those who argue that the gaokao should not be the sole route to success. Writer and businessman Luo Yonghao never took it; ironically, he later made his fortune on a chain of TOEFL and GRE test-prep centers. Perhaps the most famous example is Han Han, a high-school dropout who is the modern paragon of the Chinese renaissance man–a race-car driver, novelist, singer, and the most widely read blogger in the world. But there are a lot more Shirley Qians than Han Hans, and the former are supposed to keep criticisms to themselves. One day, while I’m visiting Second High, Shirley asks me for help with an English passage in her test-prep material. It’s a nonsensical, grammatically dubious story about two brothers hiking up a hill, carrying luggage. “It’s not logical,” she says. She’s right. It’s unclear where the characters are going, why and how they feel about it. But then I spot a sentence that crystallizes for me the point of the passage: “Not a word of unhappiness escaped from his lips.” Curiously, Shirley abruptly stops complaining to me about the gaokao after that. Bob scored a solid 648, while his girlfriend, Julia, got a 602. (Their summer plan: to read Marquez’s One Hundred Years of Solitude together, an idea that originated from Bob’s literary-prof dad.) Daniel beat Julia by two points, with a 604, while Janice got a 616. Coppelia/Pealina/Coco/Rosalind posted a 635. Shirley’s worries were not unwarranted: Her score was just 573, good enough for college but not a top-tier one. I ask in Mandarin how she feels about her own score. She responds in playfully accented English, “Goo-dah.” But less than a minute after learning her score, Sophie and her mother have lasered in on her relatively poor result on the English section of the exam. Originally, Sophie had intended to spend her summer doing what she hadn’t done for the previous three years: kicking back. Her family and Peggy’s were going to Tibet for 10 days, and after that, nothing.